If you’re like me you might be counting down the days until school starts. I never understood my Mom’s love of August until I had kids. Ha! Tomorrow I’m sharing some educational things that we’ve been doing recently but this afternoon I wanted to share a more creative way to keep your kids entertained. I’ve shared about Kiwi Crate experience before. I love that Kiwi Crate comes right to your door and has activities that keep the kids entertained while also letting them explore their creativity a little bit. 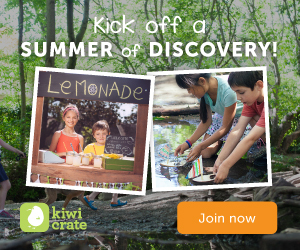 Kiwi Crate comes in subscriptions, single crates, and party favors and from now until July 31st they’re offering you the chance to try the Starlight Lantern Project for Free (you only pay $3.95 for shipping)! If you’ve been thinking about trying Kiwi Crate this is a great chance to sample a project and see if it’s something that you want to introduce in your home more regularly. Kiwi Crate is available in 3 Month, 6 Month, and 12 Month d subscriptions as well as single crates and party favors. They’ve also partnered With Target and I’ve found that these projects are great for last minute birthday gifts! Have you tried Kiwi Crate? I’d love to hear if your kids enjoyed it as much as mine! *This post contains affiliate links but all opinions and reviews are my own. Please see my link/review disclosures for more information.